Supracondylar fracture of the femur in young adults is a result of high energy injury, usually seen in road traffic accidents. Whilst in older age group, it may be an osteoporotic fracture. Condylar fracture of the femur commonly associated with supracondylar fracture (fracture above the condyles extending into the knee joint), however, it can occur as an isolated fracture, for example fall from a height which results in the tibia thrusted into the intercondylar fossa of the femur. It might be just a transverse fracture or in more severe cases, a comminuted fracture. In supracondylar fracture, if the distal fragment is intact, it might be pulled by the gastrocnemius muscle, causing marked displacement and hence may injured the popliteal vessels. Patient usually presented with history of trauma as mentioned above, and complains of typical symptoms of fracture : Pain, swelling, bruising, deformity, inability to walk and etc. Neurovascular examination to rule out any neurological and vascular deficit. 2) Joint stiffness as a result of immobilisation of the knee joint during holding of reduction. 3) As a result of joint stiffness, there is lack of fracture loading, and hence predisposes to non-union. In supracondylar fractures, a fracture line is seen just above the condyles. Or in severe cases, it may be comminuted. X ray involving the entire shaft of femur and the hip joint should be taken to rule out any fracture of femoral shaft or hip dislocation. In case of condylar fracture, beware of Hoffa's fracture. 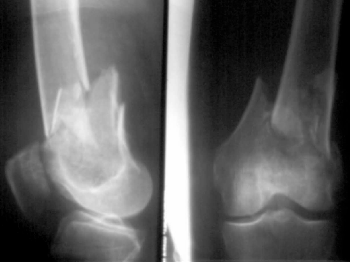 Hoffa's fracture is a coronal plane fracture involving the posterior aspect of the femoral condyles, and unless a good oblique and lateral view of knee X-ray is taken, such findings is usually missed. 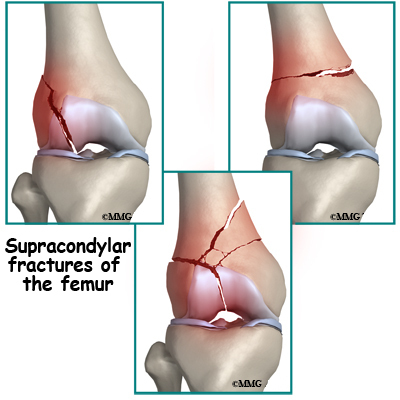 In supracondylar fracture, closed reduction is usually done in a young patient, without suffering from multiple injuries, and if the fracture is slightly displaced, or purely intra-articular or it is easily reduced. A pin is inserted to the proximal tibia for skeletal traction, and the limb is cradled into a Thomas splint with a knee flexion piece. 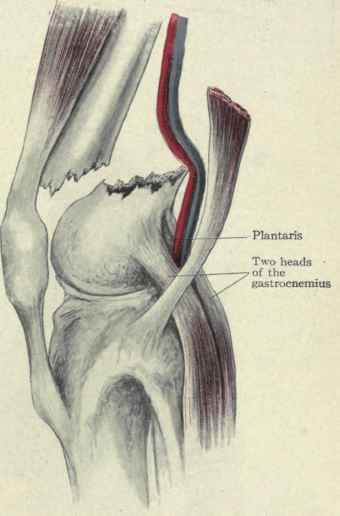 If the distal fragment is markedly displaced by the pull of gastrocnemius muscle, vertical traction can be applied with a pin inserted above the knee joint. Traction is maintained for about 4-6 weeks, and when the fractures begin to unite, traction is replaced by cast splintage or functional bracing. Partial weight bearing is then allowed where the patient starts walking using clutches. Operative methods are reserved if closed method fails, particularly in elderly patients. In such cases, fixation is done by using angled compression device. For condylar fractures, management is almost the same. For fracture of one of the condyles, fixation is done by using K wires and compression screws. In case of bicondylar intra-articular condylar fractures : dynamic condylar plate and screws.